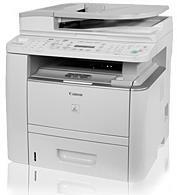 Print, Copy, Fax, Scan, Send and Network with the Canon imageCLASS D1180 Black & White Laser Multifunction Copier. Get ready for large-office capabilities in an easy-to-use compact design. With the Canon imageCLASS D1180 you can tailor your business needs to compete in today's fast-paced environment. Keeping your costs low is essential for a successful business. The 50-sheet Duplex Automatic Document Feeder (DADF) will allow you to copy or color scan from one or two-sided originals and produce two-sided output with ease, cutting your paper usage as much as half. The intelligent Energy Saver Mode reduces your power consumption to approximately three watts of energy and the product meets Energy Star guidelines, helping you save money on energy costs. Incorporating user-friendly business tools with productivity enhancing features gives you added flexibility. Receive crisp black and white documents quickly so your office can keep moving. With Quick First Print technology, your first copy will arrive in approximately eight seconds and for multiple documents, print and copy at speeds of up to 30 pages-per-minute (ppm). The D1180 includes unique features such as the I.D. Card Copy, which allows you to create copies of your identification cards or other small documents to keep for your records on a convenient one-sided document. It also can readily be connected to a network through the 10/100 Base T network, so everyone can easily share printing and PC faxing directly from their PC. The D1180 also has the convenient Send-lite function - scan one of your documents and send to a recipient through E-mail or File Server, creating a more efficient work environment. Depending on your system environment, the D1180 utilizes Ultra-Fast Rendering (UFR II-LT) technology, or PCL 5e/6 Language Support for your convenience. The imageCLASS D1180 also incorporates the Canon Single Cartridge System, which combines the toner and drum in one easy-to-replace unit, resulting in excellent image quality retention and eliminating the complication and warehousing of separate toner and drum consumables. Whatever your businesses needs are, you can take them to the next level with the Canon imageCLASS D1180.